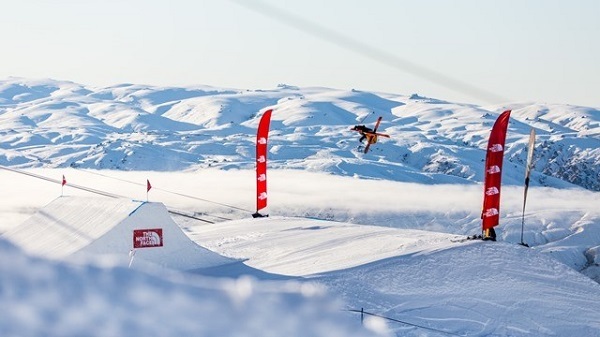 The North Face® Freeski Open of New Zealand Park and Pipe competition wrapped up at Cardrona Alpine Resort today with a spectacular showdown in the men’s slopestyle final. Top qualifier, NZ’s Jossi Wells battled hard for the win but James Woods of the UK was on supreme form and snatched a close victory. “It was head to head the whole way through, right from qualifiers,” explains James ‘Woodsy’ Woods who qualified second behind Jossi Wells in Friday’s opening event. Following two days of cold temperatures and poor visibility, competition day dawned clear and calm for today’s finals. Competition format allowed each rider three runs to impress the judges, with the top score counting for their final result. Eager to back up his 2014 Freeski Open of NZ slopestyle title, James ‘Woodsy’ Woods came out firing with a first run score of 93.50. But with Jossi Wells also looking hungry for the win there would be no chance to relax until all three runs were in the bag. With the first round complete, Jossi’s first run score of 89.75 had him sitting a close second with Switzerland’s Elias Ambühl sitting third on 84.50. On the second run Jossi and Elias both lifted their game, Jossi bringing his score up to 91.50 and Elias to 86.75, closing the gap on the Englishman but not enough to change the pecking order. A stumble on his third run would stop Elias Ambühl from improving his score any further but his second run performance with two linked double 1260s would be enough for third place. Coming into his third run Jossi Wells signaled that the top step of the podium was still the goal, attacking the top rail section and making creative use of four features where every other competitors only used three. Landing three different doubles on the jump features, Jossi’s stylish final run gave him his top score of the day of 92.50. “I knew that Jossi had a mega run in the bank and we were pushing each other harder and harder,” explains Woodsy. With the pressure on, Woodsy knew that nothing short of an immaculate final run would be enough to secure the win and made the call to up the technicality of his rail tricks before signing off with three huge hits off the jumps. His score of 94.00 was the best of the day and the podium was decided: James Woods first, Jossi Wells second, Elias Ambühl third. Cardrona Alpine Resort is the official resort partner of the NZ Park and Pipe team and today saw a strong Kiwi contingent in action on their home ground including fifteen year old Wanaka local Finn Bilous. Finn claimed fourth place in both halfpipe and slopestyle, signaling that he will be another strong contender for the podium in the future. The Freeski Open of NZ is the only Freeski event to hold Slopestyle, Halfpipe and Big Mountain competitions in one. The Big Mountain event will take place at Queenstown’s The Remarkables ski field between 1-6 September. For the first time in the event’s eleven year history, the Big Mountain event will also be open to snowboarders. This entry was posted in News, Skiing, Winter Sports and tagged James Woods, New Zealand, North Face Freeski Open, Skiing. Bookmark the permalink.